While our six month house sit in Australia led to some unexpected southeast Asia travel, we never imagined we would get to spend six days visiting Tokyo, Japan! 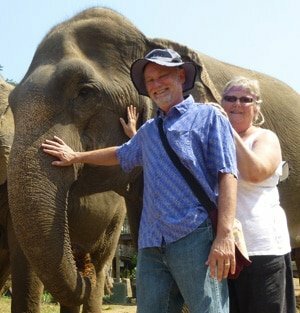 The time consuming search for a cheap airfare to get us from Bangkok to Boston was well worth the effort. Our research revealed that this long haul of a flight seemed to repeatedly layover in Tokyo. With a few minutes more of exploration, we managed to create a multi-city trip that saved us about USD$800, affording us a five nights stopover in Tokyo. 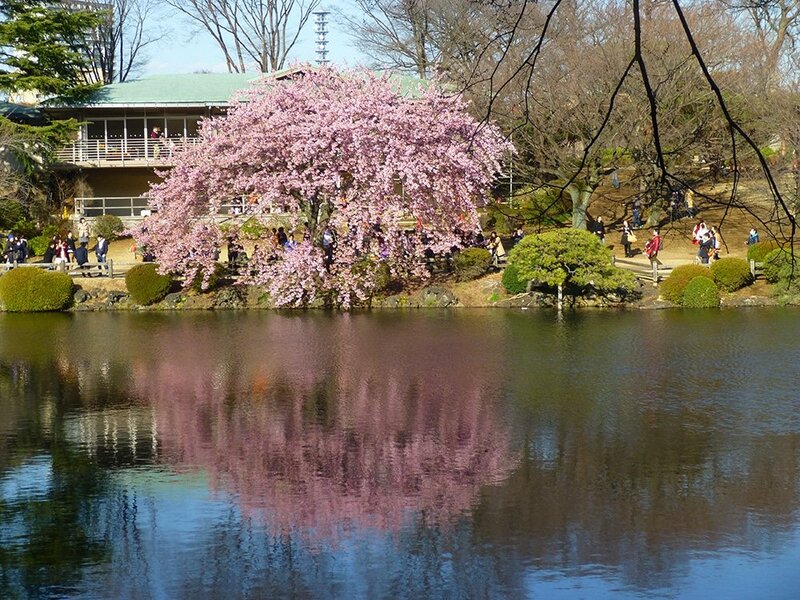 Airbnb has neighborhood guides for Tokyo which made it easy to decide where to look for an apartment, and soon we bid farewell to Thailand just as the cherry blossoms in the Tokyo parks were beginning to show themselves. After our two months of visiting Thailand and Bali, Tokyo seemed more than a bit chilly to us at the end of March. Wrapped in every layer of clothing in our suitcases, we walked briskly through the city streets, rode the rapid transit trains and visited the parks that were just beginning to green up after winter. But the real treat for us in Tokyo was the shift in flavors. 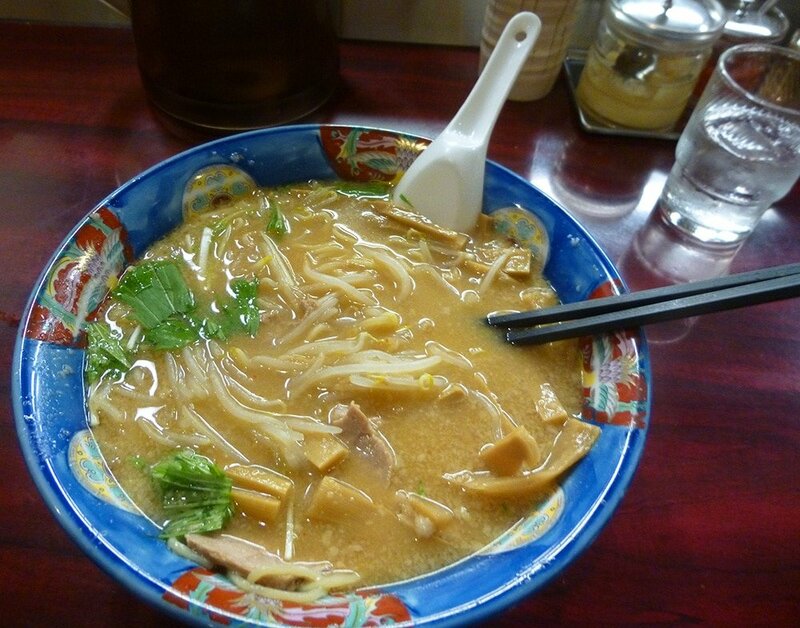 Japan offered us the mystery and yumminess of bowls of soup and noodles prepared in the tiny specialized restaurants we passed each day as we headed for the public transit stations. 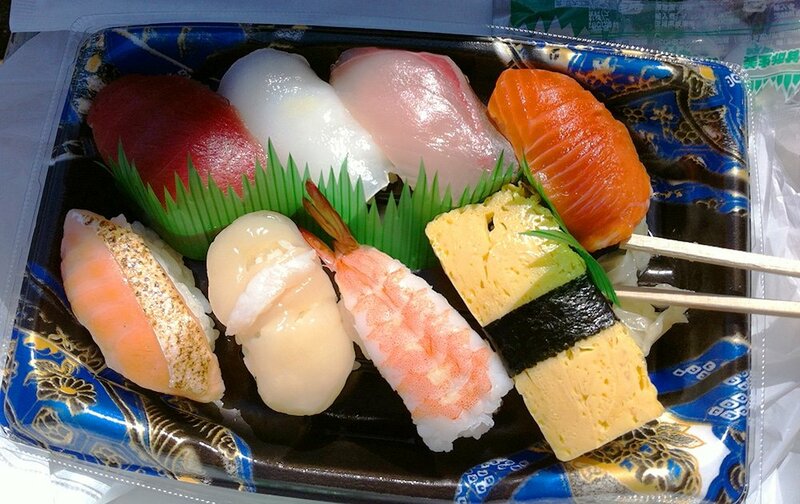 We sat in the sunshine on park benches and ate delicious sushi from grocery stores! 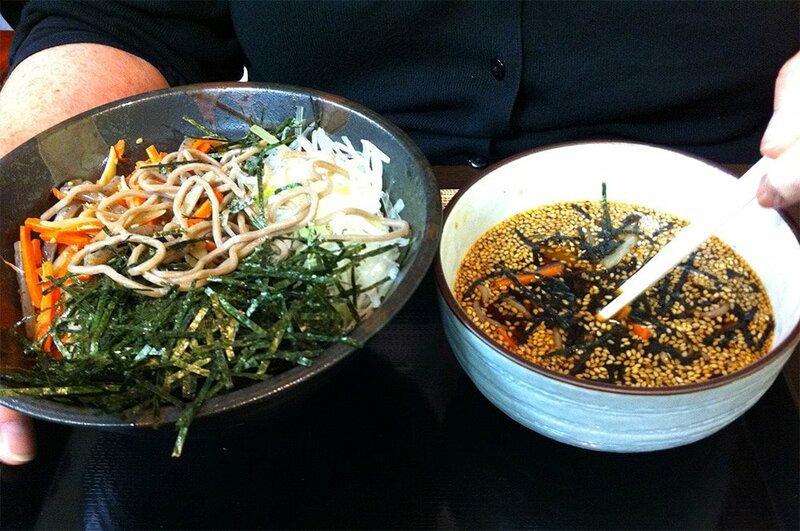 Laurie tried bunburri in a nice cafe on a day trip to Kamakura. We even had an amazing lunch in the airport. But, the best thing we had, (maybe the best thing we have ever eaten), was the miso soup at the little soup kitchen a few blocks from our airbnb apartment. In 6 days we ate there twice. The menu at this little restaurant contained two or three kinds of broth and a handful of “toppings”, Miso soup with fresh bamboo shoots may sound mundane but when prepared by the cooks in this tiny soup kitchen, it was satisfying on a deep level. 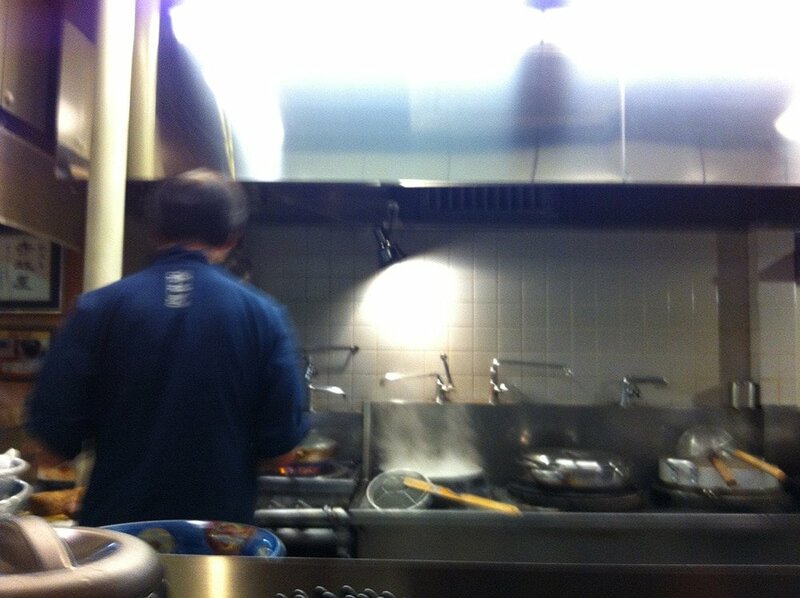 Watching the chef prepare the noodles was like watching a dance. While the pots bubbled, he carefully sliced thin strips of roast pork and prepared the other flavorful ingredients. All of it came together in a scrumptious and beautiful bowl set before us in minutes. Funny thing about those bamboo shoots- a bit of background story. While hanging out on the beach in Koh Lanta Thailand we managed to get ourselves quite sunburned. In fact, Laurie had a rash, chills and fever- sun poisoning, we think. 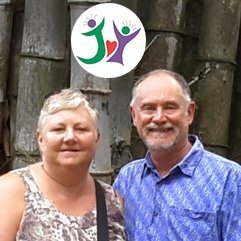 So, our final days in Thailand, in Ao Nang, where we had plans for more beach time and snorkeling, ended up to be time in a hotel room, watching cable TV. We got ourselves a bit of an upscale room, for USD$50 a night, with A/C and a big king sized bed. Watching TV, we landed on a cooking show where the host informed us he was going to learn to make rice with bamboo shoots. Sounded pretty boring to us, but he could not stop raving about it. The bamboo shoots were fresh, not the ones from a can, so we figured there must be something that we didn’t understand. When Neil saw the miso option with bamboo shoots at the soup restaurant near our apartment on Ome Highway near Shinn Nakano he had to try it. Maybe it was the transcendence of the moment, but, sorry to say we were so blissed out by our soup, that we forgot to take any photos. Fortunately, we were compelled to return a second time and managed to take a few snapshots. Nor can we tell you the names of our two favorite soup kitchens! But we are pretty sure you could wander down the streets of Tokyo not far from the Metro Tokyo Marunouchi station, and have your own life altering bowl of noodle soup. Oh that ramen looks mouthwatering! Gotta hunt for that restaurant when I travel to Tokyo this year! Thanks guys! Yes Therie, Tokyo is an awesome city. 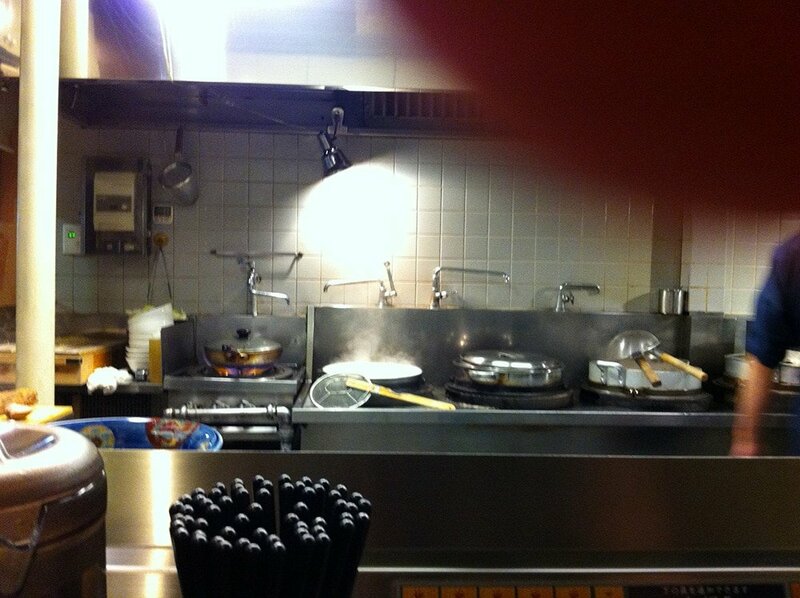 I’m sure you will find the food as delicious as we did. Thanks for your comment!